Valley City State drops to 13-12 overall, while Dakota Wesleyan – which won the NAIA Division II National Championship last season – improves to 25-4 on the season. Wednesday was VCSU’s final non-conference game of the year. The Vikings will close out the regular season on Saturday when they host Mayville State and play for a share of the North Star Athletic Association conference championship. VCSU, Mayville State and Bellevue are all 10-3 in conference play and tied for first place entering the final game of the NSAA conference schedule. The winner of Saturday’s game between the Vikings and Comets wins at least a share of the conference championship. For the Vikings, it would be their first regular season championship since the 1991-92 season. If VCSU wins on Saturday they would also earn the top seed for the conference tournament. Dierra Diegel led the Vikings on Wednesday with 13 points and eight rebounds. Gabby Martin made three 3’s as she finished with 13 points and added four rebounds and three assists. Alli Vandal knocked down a pair of 3’s and added 10 points for the Vikings. Off the bench, Kaitlin Connor scored eight and Alexis Bentz chipped in seven points. Valley City State shot 46 percent overall (23-50), 44 percent on 3’s (10-23) and 82 percent at the line (9-11). Dakota Wesleyan finished the game at 55 percent from the field (29-53), 42 percent on 3’s (10-24) and a perfect 12-for-12 on free throws. VCSU had 17 assists and 20 turnovers, while Dakota Wesleyan finished with 15 assists to just 13 turnovers. Rylie Osthus scored a game-high 24 points – including 17 in the first half – and also picked up 10 steals to lead Dakota Wesleyan. Kynedi Cheeseman added 18 points, and Makaela Karst hit four 3-pointers to finish with 14 points. Valley City State used an 8-0 run in the first quarter to take its biggest lead of the game. Dierra Diegel and Gabby Martin made back-to-back 3-pointers, and then Hannah Schlecht capped the run with a basket inside – putting the Vikings up 15-9 with 4:46 left in the first quarter. Dakota Wesleyan answered with a 9-0 run over the next two minutes to retake the lead at 18-15. The back-and-forth first quarter featured four ties and four lead changes, after which the Tigers held a 22-19 lead. Dakota Wesleyan started the second quarter with a 10-3 run, opening up a 32-22 lead with six minutes to play. VCSU’s Dierra Deigel stopped the run with a 3-point play inside, cutting the deficit to 32-25. The Tigers would not let up though and showed why they are one of the top teams in the country, pulling away to a 51-31 halftime lead. The Vikings opened the second half with a 10-3 run over the first four minutes, cutting the deficit to 54-41. VCSU was within 13 points several times in the third quarter before entering the fourth down 68-50. 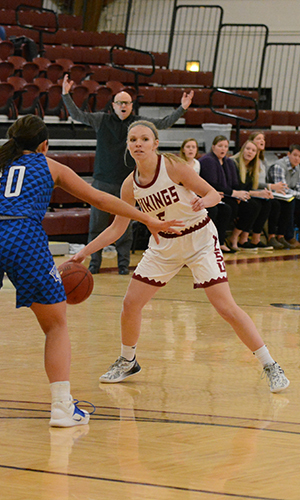 The Vikings fell behind 72-53 early in the final period, but put together eight straight points – capped by a Gabby Martin 3-pointer – to get within 11 points at 72-61, which was the closest the Vikings would be in the second half. Up next: Valley City State closes the regular season on Saturday by hosting Mayville State University at 3 p.m. The winner of that game earns at least a share of the North Star Athletic Association regular season conference championship. Dakota Wesleyan scored on eight of its first nine possessions to start the game, opening up a 17-11 lead. The Tigers extended the lead to 32-20 on Ty Hoglund’s 3-pointer with 9:00 left in the first half. Valley City State responded with a 12 straight points to tie the game. Austin Lee started the run with a jumper and Logan Nelson capped it with a basket inside. Hunter McCalla then followed with a 3-pointer from the right corner to give VCSU its first lead of the game at 35-34 with 4:37 to go. Dakota Wesleyan ended the first half with an 8-4 run to take a 42-39 lead into the locker room. Valley City State twice tied the game on Denzel Kennedy baskets early in the second half. The last time came on a bucket inside that tied the game at 51-51 with 15:19 remaining. From there, Dakota Wesleyan was able to create some separation. A quick 3 by Aaron Ahmadu put the Tigers back ahead and sparked a 12-2 run that gave Dakota Wesleyan a 63-53 advantage with 12:10 to go. After the Tigers extended the lead to 79-65, Valley City State responded with an 8-2 run to cut it back to single digits at 81-73 with 3:46 remaining. The Vikings would hang around until Wesleyan tacked on points in the last 90 seconds for the 93-77 final score. Four Vikings scored in double figures, led by 19 points from Logan Nelson. Connor Entzi was efficient for VCSU as he poured in 17 points on 7-for-10 shooting, including a pair of 3-pointers. Michael Cornelious scored 13 points, and Denzel Kennedy added 10 points and pulled down six rebounds. Freshman Hunter Sand had eight points and four rebounds off the bench. Dakota Wesleyan guard Ty Hoglund, who entered the game averaged 26 points per game, poured in 40 points on 13-for-19 shooting to lead the Tiger offense. It was the fourth time this season that Hoglund topped 40 points in a game. Wednesday night was mainly a two-man show for the Tigers as guard Nick Harden added 24 points and six steals. Valley City State shot 50 percent for the game, going 29-for-58 overall from the field. VCSU was 6-for-14 on 3’s (43 percent) and 13-for-18 on free throws (72 percent). Dakota Wesleyan finished the game at 49 percent overall (29-59), 48 percent on 3’s (10-21) and 76 percent at the line (25-33). VCSU finished with 11 assists and 19 turnovers, compared to 10 assists and 13 turnovers by the Tigers. Up next: Valley City State closes the regular season on Saturday by hosting Mayville State University for a conference doubleheader. The women tip at 3 p.m. with the men to follow at 5 p.m. The Viking men are currently in a three-way tie for fifth in the NSAA standings with Dakota State and Viterbo University.